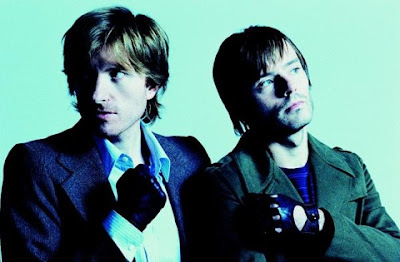 Internationally revered French electronic pop duo AIR (Jean-Benoit Dunckel and Nicolas Godin) will release their fifth studio album Love 2 on October 6th, the follow-up to 2007’s acclaimed Pocket Symphony, and the first production to spring to life from their very own state-of-the-art recording facility Atlas Studio. Nestled in the leafy backstreets of northern Paris, Atlas provided a creative haven for the band to produce these twelve new songs, recording and producing for the first time entirely by themselves. These recording sessions again saw the band handling all vocal duties and cemented their association with LA-based drummer/percussionist Joey Waronker, who had previously joined them for their intimate, three-man “Close up” tour of south-east Asia in the Fall of 2008. Stéphane “Alf” Briat, a long-time fixture of the Paris music scene, whose work with AIR dates back to some of their earliest material, came on board for the final mixdown at Atlas. A viral single “Do The Joy” will be made available on July 7th, followed by a formal single release for the summery pop anthem “Sing Sang Sung” on August 25th. AIR’s 1998 debut album Moon Safari struck a unanimously harmonious chord with music lovers around the globe and has since become an electronic pop classic. Since then AIR have enjoyed many career-defining moments and accolades, both at home and abroad, and have written, produced and collaborated on a breathtaking array of music projects. With 5.5 million worldwide album sales to their credit, the band has become de facto ambassadors of modern French pop, whose fans are drawn back to each new musical adventure by their inventive arrangements, and a playful yet unpredictable palette of sounds and songcraft.